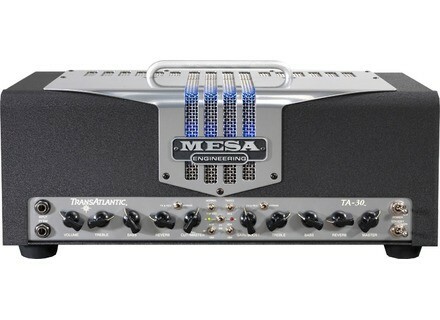 TransAtlantic TA-30 Head, Tube Guitar Amp Head from Mesa Boogie in the TransAtlantic series. Mesa Boogie presents the new TransAtlantic TA-30 (vs. the TA-15). The chassis design makes the TA-30 available in multiple formats. As a stand-alone metal encased head and styled similarly to the TA-15, the new TA-30 Head is 5 inches wider and 5 pounds heavier. For rack applications, the exact same chassis is also designed to be rackmounted and fits in the standard 19 1/2 inch rack format for your next rack build. Newly available format options is the all new, classically styled 1×12 and 2×12 TA-30 combos. The TA-30 combo styling provides an introduction to one of three new grille options for 2011. A Gray & Black Woven Jute on the ‘39 Ford-inspired ‘old chrome’ grille and Mesa Engineering logo with the grille framed by a classic TV-style front panel. Another feature for the TA-30 as a combo is the top facing, rear mounting of the chassis which pays tribute to the feel and interface of the Vox heritage, according to the company. Carvin TLB60 Vintage Guitar Carvin introduces a new Custom Shop instrument,the TLB60 Vintage Guitar. Gibson Eric Clapton 1960 Les Paul The Gibson Custom Shop Eric Clapton 1960 Les Paul has been created with the personal cooperation of the artist. Reverend Rick Vito Signature Model Reverend has announced an artist model guitar in collaboration with rock and blues artist Rick Vito.